Interior designer, fashion consultant, mother of two and Bachelor-degree-holder in Economics all rolled into one, Nida Shay certainly isn’t your average fashion business-person. Not only has she got a lot more to offer, she goes all out, and international. How did she achieve so much at such a young age? Well, FUCHSIA tells her story. Born and raised in Abu Dhabi, Nida put a lifelong dream on hold when Art as not supported at school, and Finance was deemed the safer choice at home. Having completed her Bachelor degree in Economics at the University of Manchester, Nida joined Citibank. Unable to control the urge to be in the creative field any longer, she decided to take fate into her own hands by applying quietly to Parsons School of Design in Paris (for Fashion Design), and the University of Sorbonne (for an intensive French course). Determined now to follow her dreams, she approached her parents after getting accepted in Paris. Despite initial reluctance, her parents gave her the go-ahead and, soon enough, Nida was off to Paris. Upon visiting her, they realised how well she was doing and started to take more interest in her work, encouraging her to start her own line upon return to Abu Dhabi. 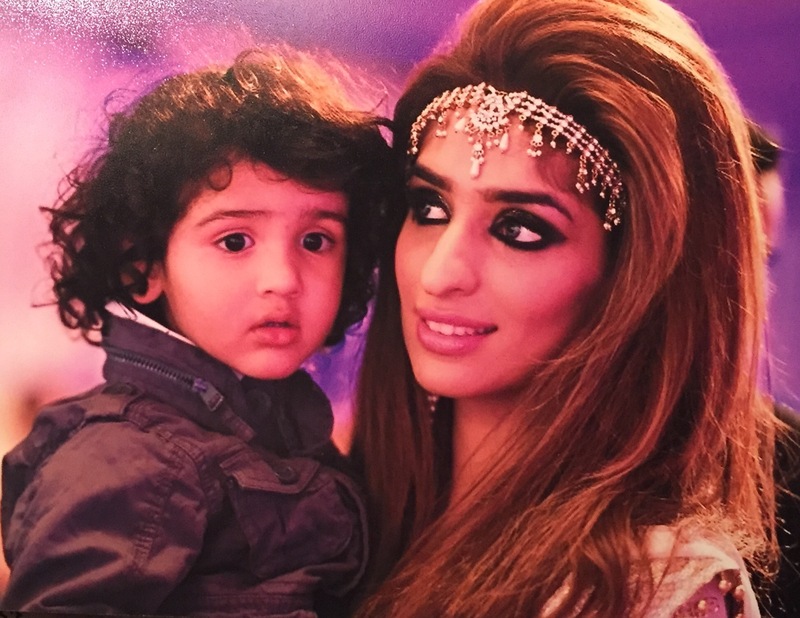 Soon after completing her courses, Nida married the love of her life, Shaheryar, and they moved to Dubai. A year later, they moved to Singapore, which has been home for the last 6 years. FUCHSIA: When did u realise you had a knack for designing? Nida: I have been designing since I was a child, probably 7 or 8. I remember sitting and sketching dresses while all my cousins played, or whilst studying. My mother says I would choose my own dresses and accessories, and refuse to wear anything I did not like, from a very early age. 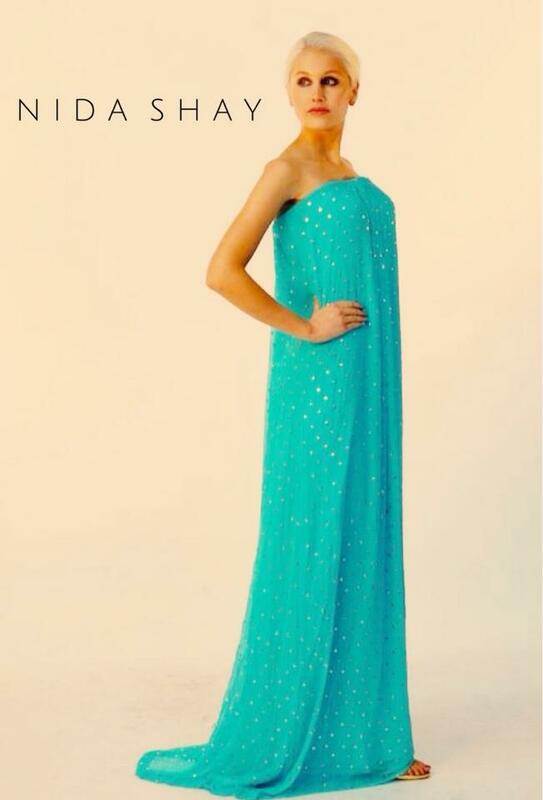 My first atelier under the name of Fatima Bashir was conceptualized in 2008 in Dubai. After a few-year break due to having kids, I rebranded and founded Nida Shay in 2012 in Singapore. FUCHSIA: How was your experience back home after your return from Paris? Nida: It was wonderful. After I returned from Paris I set up my atelier at my parent’s weekend home in Dubai, and designed my first collection upon the request of my good friends, the Sheikhas from the ruling family of Abu Dhabi. My collections were sold out one after another. Soon enough, the buyer of a Lebanese-owned multi-brand boutique began to buy out my collections; I stocked there exclusively. The response was great, and things were moving fast. Within a month or two of interning at DWP, an international interior design company based in Dubai, I was asked to join full-time,a s they were impressed with my work and natural flair for design. FUCHSIA: How did you switch between fashion and interior designing? Nida: I assisted in designing the Majlis of the Sheikh from the Ruling Family. Royal Meridien Hotel, Hotel Spa, Private Residences, and did some freelance projects with some Sheikhas in their private home. Things were coming together, and my hard work was paying off. FUCHSIA: Did your move to Singapore disrupt all that you had going for you in the Middle East? Nida: Actually, the move happened in the midst of all this. My husband was offered a job in Singapore that he was very enthusiastic about, and I did what any supportive wife would d;, I sacrificed my lifelong dream and made the move with the determination that I would make it work somehow. If I had done it once, I could do it again. I moved to Singapore, and found out I was expecting my first beautiful son. Twenty months after my first, I had my second gorgeous boy. My world was complete, but it came at a price. I suffered from complications both times, and my health deteriorated. Despite that, I took a few orders and did my work quietly. Before and after each son, I promised them I would make them proud and not give up my dream. That is how I set up my team and the atelier at my parents’ home the second time. FUCHSIA: How do you stay inspired enough to manage a business here and in Dubai? Nida: None of it would have been possible without my mother’s continuous support. We work as a team. I create, and she manages all of it at the atelier, from fabric sourcing, dying, following out instructions of the details of my design and to supervising the finished product. It is all her. She has been responsible for the designs of many bestselling patterns. My mother is my mentor. My hero. Without her knowledge, expertise and guidance, I would not have evolved in the work I am doing now. My love for fashion and interior design stems from observing her as a child while she would do silk painting, decorate the house and dinner tables and the way she would dress up and do her make up. Her gracefulness and beauty is inspiring. My father’s passion for art and finely tailored Italian and Parisian fashion is the reason I wanted to study fashion in Paris and my love for doing oil paintings. Both of them played an integral role in creating an interest in fashion, art and everything luxurious. FUCHSIA: Has the Singapore market been a disappointment after such great accomplishments? Nida: I am very pleased with the response in Singapore. I thought it would be a lot more difficult but I’ve noticed a great change since I introduced my brand in Singapore few years back. People are keen on the exclusivity and quality of hand-made and hand-embellished pieces in a world full of mass produced products. I have received messages several times from husbands thanking me for dressing their wife beautifully and many of them encourage their wives to place orders with me. 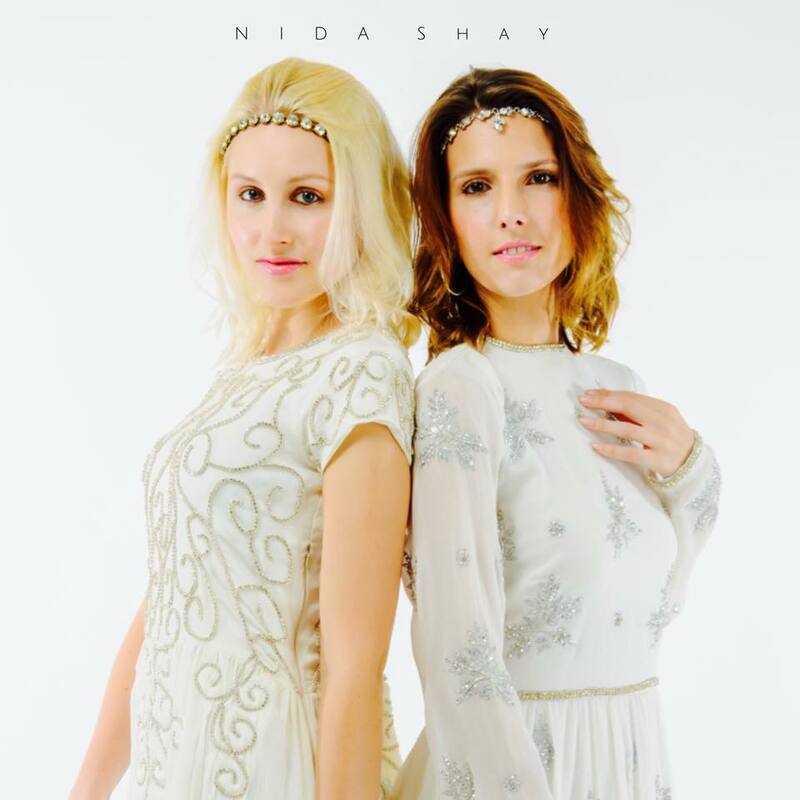 My clients tell me that whenever they attend a party they are asked if they are wearing Nida Shay. It is very rewarding and all thanks to God for the talent and ideas he has blessed me with. FUCHSIA: Who is your main clientele? Nida: An exclusive set of women who appreciate luxury and glamour who are from all over the world. I have clients from all nationalities: British, Spanish, Portuguese, Lebanese, Iranian, Indonesian, Belgian, Pakistani, American, Arab, Indian, Canadian etc. Some prefer to have them made as dresses and some as top or jackets. The work itself is adored by all. FUCHSIA: What’s the inspiration behind your designs? With all the beauty God surrounds us with, it is impossible not to feel inspired. My colour combinations and ideas come from my love for flowers, blossom trees and all animals. I love the variety of colours of stones and crystals, and my mind can’t stop creating patterns just looking at them. I dream in specific colours if you notice from the collections. This is again due to the beautiful, bright and colourful woman my mother is. I have also been adding a lot of insects and animals to the collection due to my sons. Their fascination with all sorts of bugs and creatures has opened my eyes to things I would not have noticed before. FUCHSIA: What kind of collections do you create? Nida: My collections are comprised of statement pieces. The woman wearing it and the woman designing it have the same statement to make. They are rich, glamorous pieces, with emphasis on the details and intricate hand-embellishment and embroidery. They are a nod to traditional work with a modern touch for the woman of today. You need little else to accessorize when you are wearing a piece from the Nida Shay collection. The clothes do the talking and they speak in a hundred different ways about the woman wearing it. My collections are luxurious and classic, it’s like owning jewellery, if taken care of properly, they can be worn in many different ways, and for years. FUCHSIA: You use a lot of bold embellishments on cuts which are pretty straight forward. Nida: This is my signature style. I have done pieces with different cuts and styles, but I like to work with a clean, structured cut. You will find some variations now and again, but I prefer the focus to be on the details of hand-embroidery and embellishment. The way I look at it, the fabric is my canvas and I am the artist. I draw and design the patterns as if I were painting. FUCHSIA: Do u follow the mainstream fashion or do u prefer to create your own trends? Nida: I am my own muse. I prefer to keep to my own style and design what I myself would wear. If something doesn’t appeal to me, I will not make or sell it. My work is very personal, and I put a lot of thought and time into it. There is absolutely nothing mainstream about anything I do in any aspect of my life. It is not part of my vocabulary. I’d rather be unique; which is exactly what people say after seeing my work. FUCHSIA: Have u hosted it or been a part of any fashion shows or styled any celebrity? Nida: I was designing for Channel News Asia news anchors, Suzanne Jung and Yvonne Yong, until they both left the show to focus on family a few months ago. They were very supportive of my work, and a pleasure to work with. I got great response and exposure from that. I have not taken part in any shows or hosted one yet but it is in the pipeline. I have been asked a few times to participate but I have declined as my priority was time with my boys. I would rather do something when I can commit to giving my best. So far, word-of-mouth has been working wonderfully for me. Nida Tahir Shaheryar is a fashion designer and founder of NIDA SHAY, a bespoke clothing line using delicate craftsmanship of Pakistani artisans. The line aims to support the traditional methods of handwork by using it in a modern concept to have a global appeal. Each pattern is hand designed and hand embroidered and takes numerous dedicated hours and weeks to complete. Nida is doing a great job. We are proud of her and wish her all the success.